Welcome to Vintage Advertising Posters. The first thing we want is to thank you for your visit. We understand that if you’ve come to visit is because you like old advertising posters. We would like to explain in a more extensive way we do, how we do and why we do it this way. We select every day to restore vintage posters. Our digital restoration process allows us to offer a really good print quality. On the market many posters you can buy the prints, but most of them will offer impressions in small or low quality because they have not been restored. We have chosen to sell our work to one of the best printing companies demand worldwide: FineArtAmerica. They are especialized in printing artworks on different media. 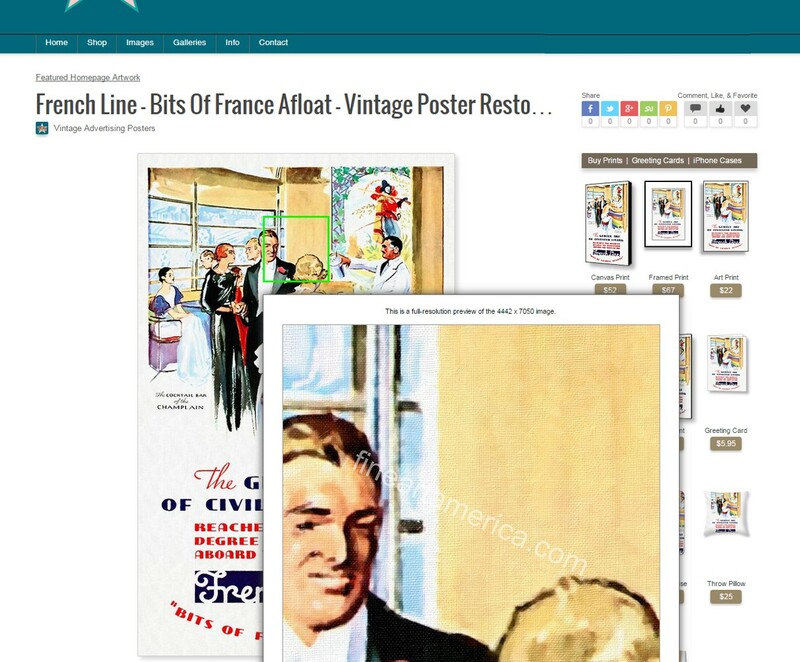 It is the only one in web stores that offers a full-resolution preview of the original view. On their websites what you see really is what you get at home after making your purchase. But be careful even in FineArtAmerica. There you can find many vintage posters to buy. Do not forget before you decide to buy, use their system zoom to see the full-resolution. If once you have seen the complete resolution it doesn’t satisfies you, do not buy. If the person who sells the poster has not activated the full resolution zoom view, you never know if what you buy has the best quality. We and FineArtAmerica guarantee your satisfaction for printing on the measures we have in our store. Many really big, up to 48 “x 70” or more. The warranty is really simple: if you are not satisfied, FineArtAmerica returns you the money you paid for the printing. In all our restorations we have applied a nice canvas texture because this gives the poster a look of artwork, which are really little masterpieces of art, illustration and graphic design. But we are not a factory, we are craftsmen. If you want something special from one of our restoration work, please use the form next to each poster on our website and will gladly talk to you about what you want for your home. We also accept commissioned work. If you have a digital file or an old photograph of a poster that you would like printed in a large size to decorate your home or your business, we can restore it for you. Use our form for commissioned work to send your file and comments about the work and quickly contact you. We are very happy to have your visit and we will be if you write to us and give us your opinion about our work, because it will make us improve every day.